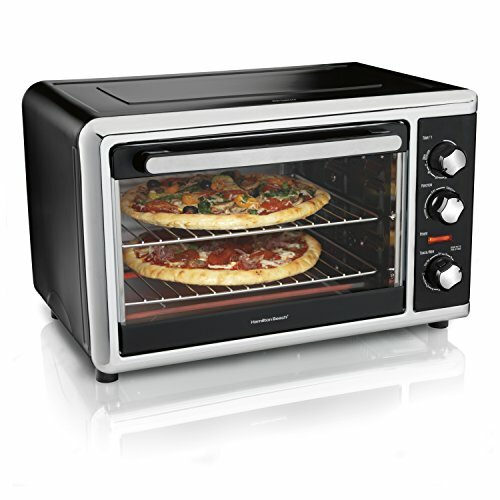 From Hamilton beach, this countertop oven provides maximum versatility including bake, broil, convection and rotisserie. The extra large capacity fits two 6"x10" loaf pans, two 12" pizzas or two 9"x13" loaf pans. Its revolving rotisserie fits a 5 lb. Chicken or roast which self-bastes as it turns. The convection setting bakes faster and more evenly than a traditional oven. Bake and broil settings have two hour timer. Includes two cooking racks, two baking pans, broiler rack and rotisserie accessories (skewer, lifter and drip tray).